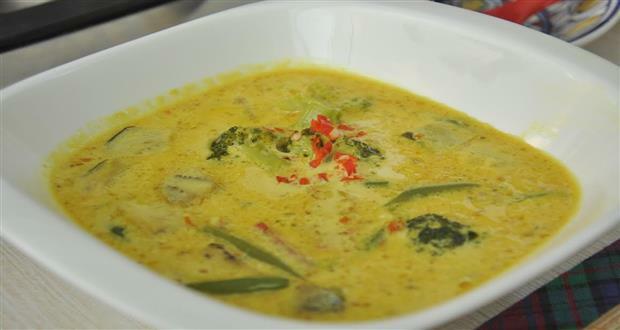 Industrial engineer turned gourmet food restaurateur, Varun Tuli prepares a zingy curry with vegetables, spices and fresh turmeric giving this oriental savory an Indian kick. 1.Heat oil in a wok, and then add turmeric, chopped galangal, lemongrass, chillies and saute. 2.Add evaporated milk & a just a little bit of water (1/4 cup) to thin the curry and let it boil. 3.Season with salt, sugar and cook till dissolved well. 4.Remove from heat and let it cool. 5.Saute vegetables with some oil and garlic in another pan. 6.Add the pinch of salt and let it saute for a couple of minutes. 7.Now add the curry & bring to boil. Cover it and let it simmer for 7 - 8 minutes till the vegetables cook. Grab this delicious curry with hot rice for wonderful taste.